Mulan will always be the favored movie in the house however Cloudy with a Chance of Meatballs is a very close second. Last month Joe and I took Sierra out on Date Night with us to see her first ever in-the-theater movie. I thought she might be a bit young and considering her performance at Stone Mountain I knew she wouldn't like the noise but we thought we'd give it a whirl. 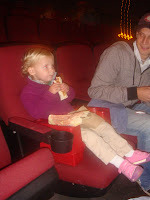 We picked up Taco Bell (on her her favorite places) on the way so that we could have dinner in the theater. We got a booster seat and there she sat until the movie started and then in was either mine or Joe's lap. We started at the front of the theater but it really freaked her out so we ended up in the 2nd to last row of the theater just to be farther away from the screen. She pulled her "Mommy, I have to pee" trick but once the movie started she got way into it. We had to commentary almost the entire movie to get her excited for all the cool food falling from the sky. The "hamburgerers" were her favorite. We have been back to see it again since, just once more. Super cute movie! 3 thumbs up!